Saturday featured 12 matches with the winners earning a ticket to the Sweet 16 next weekend. Eight of the matches ended in sweeps, although two of those provided upsets as No. 9 Creighton and No. 11 USC fell to Washington and San Diego respectively. Among the winners was No. 14 seed Marquette, which punched its first ever ticket to the regional round. No. 3 Illinois and No. 16 Washington State stayed alive in the tournament with four-set victories, while Michigan outlasted No. 12 Pittsburgh in five sets to claim their first regional semifinal berth since 2016. The regional field is now complete with four unseeded teams among the group with Washington, San Diego and Michigan joining Friday winner Florida. Kentucky served up eight aces and outdid Purdue 49-27 in kills in the sweep, although the Boilermakers outblocked the Wildcats 9-3. Leah Edmond (13) and Brooke Morgan (12 kills, .429, 4 aces) led the Wildcats. Blake Mohler was the top Boilermaker with 10 putaways on an error-free .625 hitting effort (10-0-16) and eight blocks. Kentucky makes the Sweet 16 for the second straight year and fifth time in program history. Penn State earned its 100th all-time NCAA Tournament victory, also the 100th for coach Russ Rose putting him in elite company as the first Division I coach to achieve the feat. The Nittany Lions outdid Syracuse .290 to .138 in efficiency, 4-0 in aces and 9-6 in blocks. Four PSU players posted double-digit kills in the sweep: Tori Gorrell (11), Nia Reed (10), Jonni Parker (10) and Taylor Leath (10). Polina Shemanova posted 10 kills and eight digs to lead the Orange. Nebraska served up seven aces and hit .384, while holding Missouri to a .216 effort en route to the sweep, which claimed the Huskers their 34th regional appearance in 37 NCAA Tournament outings. Mikaela Foecke downed a match-high 16 kills while hitting .667 (16-0-24) and adding seven digs, four blocks and two aces for the Huskers. Lexi Sun chipped in 11 kills and eight digs. Leketor Member-Meneh (11) and Kylie Deberg (10) paced the Tiger offense in the loss. Mizzou’s Riley Sents pulled up her 1000th career dig with her seventh of the night. S2 l With seven digs thus far tonight, redshirt junior DS @RileySents has produced 1⃣,0⃣0⃣0⃣ for her career. 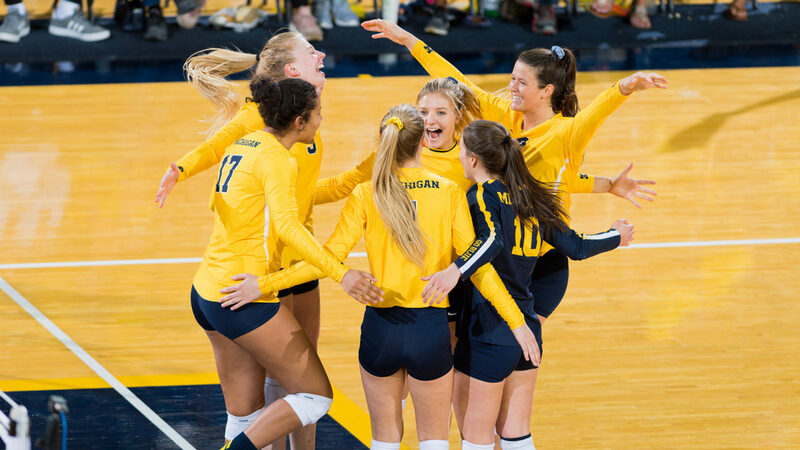 Michigan earned its seventh Sweet 16 appearance and first since 2016 with a five-set marathon win over Pittsburgh, handing the Panthers just their second loss of the season. Pitt finishes the year with a .938 winning percentage (30-2), its best ever, and the most wins since going 32-6 in 1990. Pitt led the way in kills (62-58) and blocks (13-12), but trailed the Wolverines in efficiency (.221-.181) and aces (7-3). Pitt hit -.077 (7-9-26) in the final stanza. Michigan’s Carly Skjodt notched a match-best 20 kills, her 11th 20-plus kill effort of the year, to go with 13 digs. Paige Jones also added a double-double with 11 kills and 10 digs. Nika Markovic put down a team-best 19 kills for the Panthers, while Zoi Faki (12 kills, 23 digs), Chinaza Ndee (10 kills) and Layne Van Buskirk (10 kills, 8 blocks) followed. Washington put up 14.5 blocks and outhit Creighton .240 to .113 in the sweep, which gave the Huskies their sixth regional berth in the last seven seasons and 14th in program history. The loss dropped Creighton to 29-5 and ended their 21-match win streak and school record 15-match home win streak. Samantha Drechsel notched a match-high 14 kills for UW, while Lauren Sanders added seven kills and eight blocks. Taryn Kloth was the lone Bluejay to reach double-digits, turning in 11 putaways, while Noami Hickman put up four blocks. Marquette will make its first ever NCAA Regional appearance after sweeping Cincinnati. The Golden Eagles served up eight aces and notched 11 blocks in the win, which also saw the team outhit the Bearcats .260 to .110, including limiting Cincy to a -.031 effort in Set 3 (8-9-32). Allie Barber piled up 18 kills on a .400 hitting effort to pace Marquette in the win. Jenna Rosenthal added a team-best six blocks. Jordan Thompson posted a team-high 16 kills for Cincinnati, while Jade Tingelhoff wrapped her career with a 27-assist, 11-dig double-double and four blocks. BYU will make its seventh Sweet 16 appearance after sweeping rival Utah for the second time in 2018 (also Sept. 13). The Cougars are hosting a regional for the first time since 1986. BYU hit .410 in the match, while limiting Utah to a .202 effort. The Cougars also led the way in kills (54-34), aces (4-3) and blocks (6-3). Roni Jones-Perry downed 20 kills on a .471 hitting effort, while Heather Gneiting chipped in 12 putaways and hit .688. Dani Drews was tops for the Utes with 13 kills on a .345 hitting night, while Kenzie Koerber added nine putdowns. The crowd of 5,183 was the second largest home crowd in BYU history, behind the Utah game from earlier in the season. Minnesota outhit South Carolina .384 to .147, including clips of .542 and .472 in Sets 1 and 3, and served up six aces, while allowing just one in the win. Minnesota’s Stephanie Samedy racked up a match-high 12 kills, while also adding seven digs, three blocks and an ace. Regan Pittman added nine kills, while hitting .600 (9-0-15) and putting up a team-high four blocks. Mikayla Shields turned in eight kills and eight digs to pace the Gamecocks. Illinois will make its 18th trip to the Sweet 16 after outlasting Louisville in four sets, thanks in part to a .281 to .075 advantage in hitting efficiency and a season-best 19 blocks. Jacqueline Quade posted a 14-kill, 12-dig double-double to lead the Illini, while Beth Prince notched 10 putaways. Jordyn Poulter turned in a 44-assist, 10-dig double-double and added seven blocks. Ali Bastianelli put up a season-high 10 stuffs. Melanie McHenry and Amanda Green registered a match-high 17 kills apiece to lead Louisville. Washington State earns its first Sweet 16 berth since 2002 with a 3-1 win over Tennessee, which featured 13 Cougar blocks and six aces. McKenna Woodford (19), Taylor Mims (17) and Jocelyn Urias (14) paced WSU with double-digit kill tallies, with each hitting .250 or better. Claire Martin led the Cougars at the net with seven stuffs. Tessa Grubbs accounted for a match-high 21 kills, while hitting .306 for the Vols. Erica Treiber (13 kills, .435, 5 blocks) and Addisyn Rowe (10 kills) followed. Sedona Hansen turned in a 38-assist, 10-dig double-double. Stanford extended their home win streak to 34 matches and season win streak to a school-record 28 matches, while reaching the 30-win plateau for the 19th time in program history with a sweep of Loyola Marymount. Stanford hit .438 in the match, its second best effort of the season, while keeping LMU to a .144 clip with help from 11 blocks. Kathryn Plummer led all hitters with a 16-kill, 10-dig double-double while hitting .519 for the Cardinal. Meghan McClure added 12 kills. Sara Kovac notched a team-best 12 kills for LMU, but hit just .118 on the night. San Diego outhit USC .279 to .165, including .300-plus efforts in the final two stanzas. Katie Lukes was the lone Torero to reach double-digit kills with 12, while Emily Baptista (13) and Khalia Lanier (12) did so for the Trojans. USD will make its first NCAA regional appearance since 2013 after beating USC for the first time in postseason history, snapping a streak of seven losses against the Pac-12 side. You forgot to mention Foecke had ZERO errors on the weekend.